MARGATE CITY, NEW JERSEY – Nearly 200 people helped raise $7,000 for the inaugural Walter “Ed” Vizthum Scholarship Fund Drink ‘N’ Shoes Saturday, July 14 at the Margate Log Cabin. Of the 22 teams that entered the horseshoe tournament, the Flippin Fiends team of Tj Jannsch and Bud Smith took home first place. David Williamson and Paul Smith took home second place and JP Gronlund and his sister Lindsey Gronlund Burwell, team Ironworkers, took home third place. The event was held in honor of Vizthum who died at 32-years-old on Aug. 28, 2017. His friends and family created this scholarship fund to provide assistance to incoming freshmen at Holy Spirit High School beginning with the 2019-2020 school year. Scholarships will be awarded based on financial need, academic merit, an essay contest and letter of recommendation. 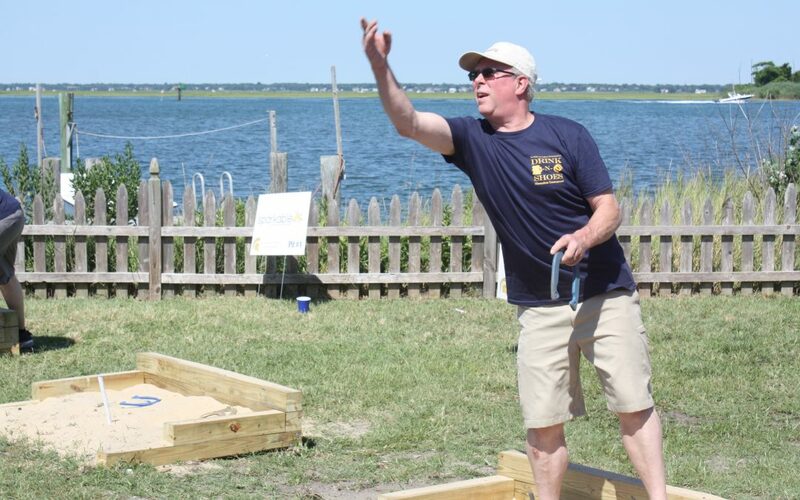 Colmar True Value Home Center in Margate donated all the material for the horseshoe pits to be built. The Cove, Schroeder Law Group, The Margate Log Cabin and Sparkable all sponsored the event. Many of the attendees were classmates of Vizthum who graduated from Holy Spirit in 2003 who came in from across the country including Illinois and California.